These are actually very sheer, which is not what I expected since the description says they are "lined". I bought them because I needed a specific length and width, in white color, and this style. They fit perfectly in my sitting room, and turns out that the sheer fabric works out because it lets light through in the mornings, and my cats can see through them. They are very pretty, just very sheer as well. Rhapsody Thermavoile 'lined' panels are a European style of a high twist Voile. Panels are lined for energy savings, light reduction, and noise reduction. Panels are polyester, and require dry cleaning. Panels are available in four colors, two widths, and four lengths to suit any need. Panels each sold seperately. For proper fullness, panels should be 2-3 times the width of your window. Love, love, LOVE! The fabric and look is romantic and the quality is great. They let in a lot of light but because they're lined I can't see my neighbors (and they are realllllly close. Like I can practically touch their window close.). If you're looking for something to keep the light out these aren't for you. These curtains are so beautiful and tasteful. Flowing fabric with thermal protection from the heat and cold. My kitty loves to be out on the screened porch and these curtains allow me to keep the door open for her and keep the heat out and a/c in during the summer. I love this curtain panel. It hangs very nicely and the fabric looks soft. I didn't measure my window correctly and therefore the panel doesn't reach all the way to the floor, but I decided to use it anyway and I ended up liking the look. It won't get as dirty if it's not touching the floor, after all. I do recommend buying more than one of these at once, since most windows will look better with a panel on each side, as pictured. Beautiful slightly sheer panels. Love that each panel is 108 inches wide. Just what I was looking for. At how nice they are. They don't really block the sun but they look good and hang nice. 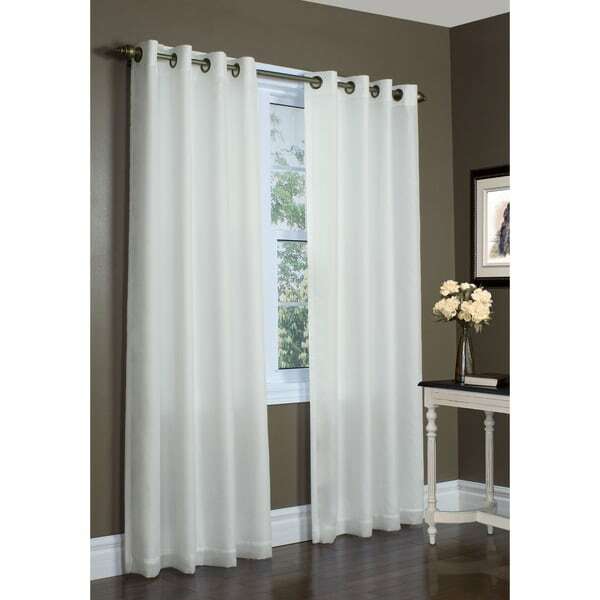 These are sheer voile curtains with a sheer liner. They are see-through. These are perfect for my bedroom, ordered six of the panels in white and they look great! Love! Good quality and great price! "What is the width of each panel? How can you order curtains without knowing how wide each panel is?" "I don't see the width measurements anywhere, just that you have two options. Where do I find out the width measurements/options? I have the length option tab only." "Hello. What color metal is the grommet?" Matches the other curtains I already have. "is the ivory towards the natural color or yellowish?" In my opinion they appear to be similar to natural in color. It is more of a beige. "Picture shows baby blue, but description is aqua. Is this a clear blue, or does it have a green tint (I.e., aqua)?" "Are these curtains sold by the pair or single panels. The measurement is 104" for the width which makes me think they are two panels at 52" each. Can you please provide a better description?" They are single panels. They offer 2 widths and 4 different floor lengths. Width is 138 inches , how many panels will we need?